Sun., June 24, 2018, 5:55 a.m.
Around the Northwest League and the Texas Rangers affiliates for Saturday’s games. Tri-City 7, Spokane 4: Chris Bec went 3 for 5 with two doubles and three RBIs and the visiting Canadians (3-6) topped the Indians (2-7). Obie Ricumstrict and Cristian Inoa hit solo home runs for the Indians, who have lost four in a row. Starter Tai Tiedemann allowed five runs – three earned – on five hits and three walks. He hit three batters and struck out four. Boise 9, Eugene 4: Matt Hearn went 3 for 4 with a double and three RBIs and the visiting Hawks (4-5) beat the Emeralds (5-4). Danny Edgeworth and Luke Morgan drove in a pair apiece for Boise. Everett 8, Tri-City 4: Ryne Ogren went 2 for 4 with a double and three RBIs and the AquaSox (6-3) beat the visiting Dust Devils (5-4). Luis Asuncion and Mason House hit solo homers for Tri-City. 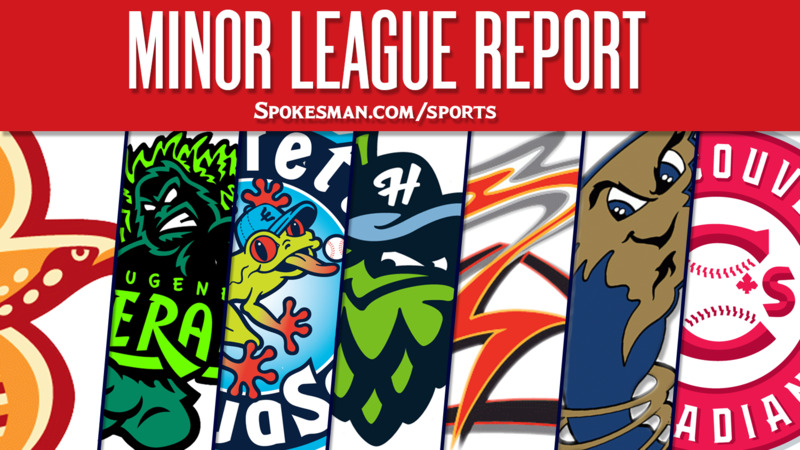 Salem-Keizer 9, Hillsboro 5: Diego Rincones hit a three-run home run and the visiting Volcanoes (7-2) defeated the Hops (4-5). Rincones went 4 for 5 with a pair of doubles and drove in five in total. Tra Holmes hit a solo shot for Hillsboro. Round Rock 2, Nashville 1 (10): Hunter Alberto singled in the free base runner in the 10th inning and the visiting Express (32-42) edged the Sounds (33-39). Drew Robinson hit a solo homer in the ninth to prompt extra innings and finished 2 for 4. Corpus Christi 4, Frisco 3: Yordan Alvarez hit a solo home run, his 10th of the season, and the Hooks (48-26) edged the visiting RoughRiders (26-49). Reliever C.D. Pelham made his first Double-A appearance and struck out one in a perfect inning. Winston-Salem 5, Down East 3: Micker Adolfo blasted a three-run home run and the Dash (44-29) beat the visiting Wood Ducks (35-38). Eric Jenkins and Brendon Davis hit solo homers for Down East. West Virginia 8, Hickory 6: Brett Pope hit a three-run homer and the visiting Power (40-29) beat the Crawdads (30-41). Oneil Cruz added a solo shot, his 10th of the season, as insurance in the ninth inning. Former Indians starter and Rangers’ 2016 second-round pick RHP Alex Speas will undergo Tommy John surgery. Speas was placed on the minor league disabled list almost two weeks ago. His timeline for return is late 2019. Texas promoted RHP Edgar Arredondo and LHP C.D. Pelham to Frisco from Down East. Pelham is the highest-ranked relief prospect in the system. Published: June 24, 2018, 5:55 a.m.